Unfortunately, sights like this are far too common. Marine debris can impact our ocean in many ways, one of which is wildlife entanglement. Here, a sea turtle is entangled in a derelict fishing net. Luckily for this sea turtle, it was discovered during a NOAA removal effort. 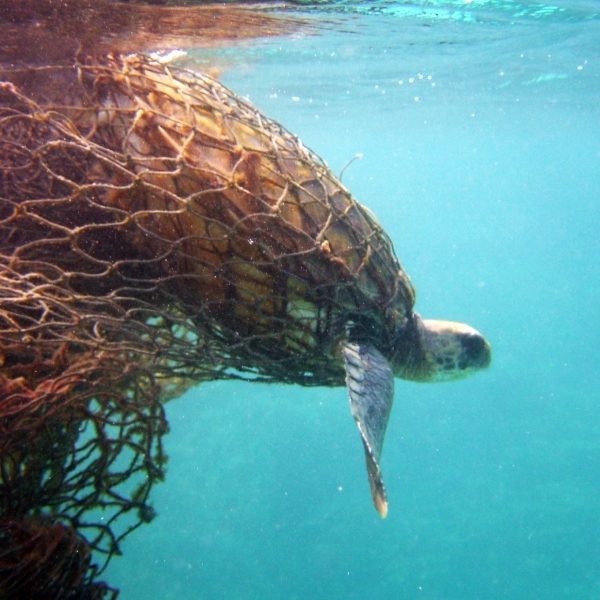 As members of the NOAA marine debris removal effort in the Northwestern Hawaiian Islands were about to start the process of removing a large derelict net ensnared on some coral, they found a surprise— this poor entangled sea turtle! 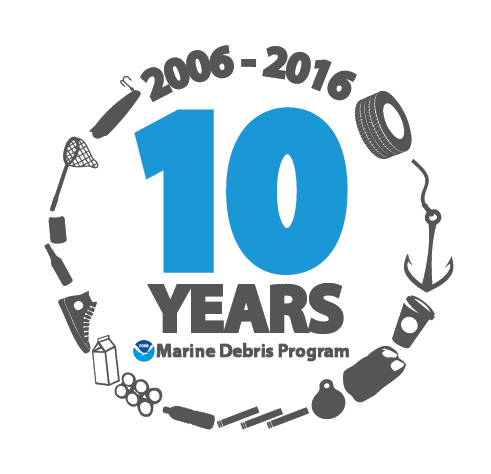 Each year, NOAA supports this effort to remove marine debris from the Papahānaumokuākea Marine National Monument, which resulted in over 14.5 metric tons of debris collected last year alone! Snorkelers worked carefully to cut away the derelict net. Once they found the entangled turtle, snorkelers got to work to free it. They carefully began cutting away the derelict net, careful not to harm the animal. The entangled turtle would not have been able to free itself and would likely have died if it had not been found. It took some time to work the turtle free from the net. Having become severely entangled, likely by first swimming into the net without realizing it, and then entangling itself further as it struggled to be free, the turtle would not have been able to free itself on its own. It would have likely perished in a short amount of time via starvation from not being able to locate or ingest food, exhaustion or drowning as it struggled to reach the surface for air, or predation, as being caught in a net made it an easy target for predators. Luckily, this turtle’s encounter with marine debris had a happy ending. This turtle was fortunate enough to be found and released. Unfortunately, many animals that are affected by marine debris are not so lucky. Those involved gained the truly rewarding feeling of seeing the direct benefits of their work as the newly-freed turtle happily swam away. Although many efforts against marine debris don’t have the benefit of seeing their positive impacts, all efforts— no matter how small— make a difference. A fisherman who recycles his old net may prevent this from happening to another creature. The city-dweller who chooses not to take a plastic bag from the grocery store and instead brings a reusable bag may prevent another turtle from ingesting plastic debris. We can all make a difference. People are the sole cause of marine debris, but that gives us the power to defeat it. To see the video of another heartwarming release, check out our website.